The answer is YES you can achieve MASTERY. Learn more in Call Receiving Mastery ebook and Power Point with actual calls, the first and only training to offer a ‘TOOL BOX ‘ full of practical best practices accompanied by 9-1-1 study calls in a Power Point CD to bring the information alive. Call order on CD or Download (be patient, the 911 calls make it a large file). 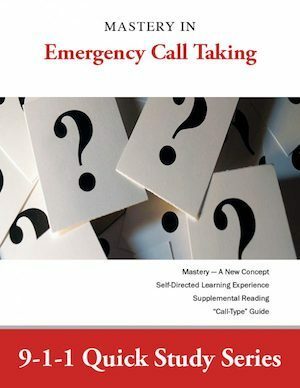 This concise book explores competency levels, KSAs, tools and practical and useful information for Emergency Call Takers.. 9-1-1 calls embedded in a Power Point slide show demonstrate the concepts offered in this training. The 150+ page book is accompanied by a CD or downloaded ppt with actual 9-1-1 calls. Use the call to determine how the information in the book compares to the slides and calls! Great NEW concept in call taker training for much less than one workshop and will live long past the ‘lecture’. Comparable to 10 hours of training, retraining or inservice. What we like to do with this is introduce the TOOLS and then have the learners identify where the tools were used or MISSING in the calls presented. Awesome learning.